AJ Simons' life has been connected to music since early childhood. At age 5 AJ was already performing in operas such as Bizet’s “Carmen”, Verdi’s “Macbeth” and Berlioz’s “Faust”. In addition to singing, AJ also played violin and piano, performing in concert halls, theaters and entering music competitions all around Italy. In 1999, his musical view changed radically as he became inspired by rock and heavy metal. 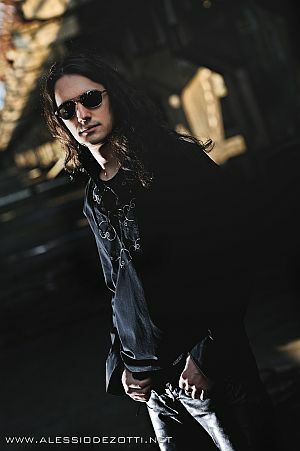 AJ then decided to pick up an electric bass and the following year he formed his first metal band. Throughout all this time AJ continued his musical training, receiving conservatory degrees in music theory, classical harmony and violin. In 2004, he entered the Lizard Modern Music Academy in Padova, playing rock, pop, jazz and fusion under the guidance of Roberto Pascucci (bass player for the pop stars Paola & Chiara). AJ was also studying jazz harmony, composition and aesthetics. He finished the four-year course in two years with outstanding marks. During this time, he also started writing his own material. His first self-released EP, “Working on youth works” was broadcasted on the Italian national radio. Over time, the AJ project became a real band: “AJ’s Nightborn”, recording two more EPs: “Nightborn”and “Neverending Road” playing festivals such as Music Village (the biggest Italian festival for unsigned bands) and some other selected gigs. In the Summer of 2005, AJ was asked to join a newly formed metal band, Burning Black. He joined as a full-time member just in time to record the band's second demo, “Fight to Dream”. 2007 was a breakthrough year for Burning Black: the band opened for the Italian dates of Udo, Primal Fear, Rage, Linea77, Soul Doctor, Bonfire and White Skull before signing a deal with Fuel Records for the release of their first full length album. “Prisoners of Steel”, which hit the stores in 2008, was acclaimed as a gem of uncompromising heavy metal. The band toured restlessly, playing its first headliner shows in Italy, and opening for Mystic Prophecy in Switzerland. In 2009, Burning Black played a sold-out show supporting Volbeat, followed by an unforgettable European tour with ex-Savatage singer Zak Steven's Circle II Circle and Manticora. The band also played more shows in Italy supporting Helstar and headlining local summer festivals for the first time. Shortly thereafter, Burning Black caught the interest of the famous German metal label Limb Music, which offered a record deal for their second album: “MechanicHell”. The album was released at the end of 2009, doubling immediately the sales of his predecessor. How to have a full-time career in the music industry.